Human Intelligence vs. Artificial Intelligence. A slim book, but one that is brimming with the future, with a global reach, an enjoyable read that will appeal to a wider audience, not just tech or legal experts. It condenses the thoughts of the author – one of the leading European experts in privacy and data rights – and his reflections on the digital world and its rules. Easy to read in a few short hours, original and politically incorrect, for anyone interested in finding their way in the era of the Internet of Things and Big Data algorithms. 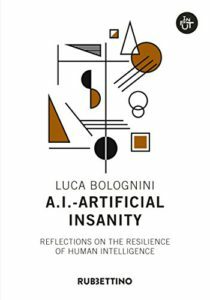 This brief book offers a visionary but adept perspective on the scenarios that await us (and that, in part, we are already experiencing): an abridged yet unadulterated, open-minded and, at times, un-PC analysis of our “Destiny 4.0”. A destiny shaped by cold, robotic hyper-rationality, perhaps or… perhaps not. Hence the title: Artificial Insanity, a snipe at the relentless, all-pervading Artificial Intelligence. For a “rule of human law”.